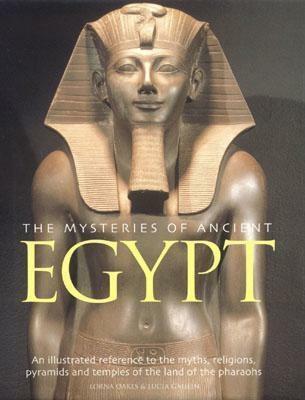 The mysteries of ancient Egypt is one of my favorite reads till now. This book is a fascinating guide to the mythology and religion of ancient Egypt, and to the awe-inspiring temples and tombs of the world's first great civilization. With maps, chronologies, and artworks supplementing with photographs, this book captures the essence of this fascinating epoch. This book has chronological charts of events that happened in ancient Egypt. The ancient Egyptians emerged about 5,000 years ago and the society flourished for three millennia. Their most striking monuments - notably the pyramids and the Great Sphinx at Giza, and the royal tombs in the valley of the Kings - were tourist attractions in Classical times just as they are today. The atmosphere created of mystery and speculation by ancient Egyptians gave a rise to a superstition that survived into the modern age. Religion was a fundamental part of the life of every Egyptian. Many archaeological sites were the focus of religious activity. For most of its ancient history, Egypt was ruled by all-powerful kings or pharaohs. This book is divided into two parts. First, consist of all the sacred sites of ancient Egypt. Second, consisting of Gods, myths and religion of ancient Egypt. I like the second part most. This book is an illustrated reference to the myths, religions, pyramids, and temples of the land of the pharaohs. A compelling guide to the most famous burial sites, including Giza, Saqqara and the Valley of the Kings. It's like a tour to sacred sites from the impressive mortuary temples of the pharaohs to those dedicated to the many Gods and Goddesses. The author did an in-depth research before writing. It has information of the crucial role that religious beliefs and mythology played in one of the most intriguing periods of ancient history. I find so many interesting facts about Egypt in this book. Egypt was one of the earliest places to accept Christianity, which was said to have been introduced in the middle of the first century AD by St Mark. Stories or myths evolved in all cultures in order to provide a divine explanation for the fundamentals of human existence. Many sources reveal that the King was identified with a God, both in life and after death. The people of ancient Egypt were terrified by the prospect of dying away from their beloved Egypt in case this meant they would not be buried close to the Nile, and would not receive the all-important funeral. The intriguing process of mummification developed because of the belief that the survival of the body was necessary in order to reborn into the Afterlife. Magic and superstition played a crucial part in daily life and were by no means considered unorthodox or an alternative to the religion of the state temples. A priest used to perform rituals in the cult of a state deity could also be called upon to carry out what we would term magic or sorcery. State and popular religion were clearly interrelated. The Egyptian history is vast and it is very difficult, to sum up, all the possible information in one book. The author tried her best in doing so. I like the detailed information on every topic. But sometimes the pictures and content are used again and again. I don't like that very much. This book is lavishly illustrated with more than 750 photographs. But I really recommend this book, especially to all the history lovers. It's a must-read. The allure of ancient Egypt has endured over many centuries - and this comprehensive volume offers further intriguing insights. It examines in authoritative detail the main sites, temples, and tombs, and investigates how mythology and religion underpinned this civilization. The first section of the books looks at the tombs of ancient Egypt and devotes chapters to the most famous burial sites: Giza, Saqqara and the Valley of the Kings, where the tomb of the boy-king Tutankhamun was discovered. The second section of the book investigates the temples, from the impressive mortuary temples of the pharaohs, such as Ramesses 2, to those dedicated to the many Gods and Goddesses of ancient Egypt, including Satet and Hathor. The third section examines the relationship between the pharaoh and the Gods. It introduces us to the Gods and Goddesses: their characters and identifying features, the myths surrounding them, and their role in creation. It then discusses the pharaoh as the human embodiment of a divine being and examines how the priests underpinned the divine order. The last section looks at the religious beliefs and practices that accompanied the ancient Egyptians through life and death. Elaborate funerary rituals, offerings, and superstitions reveal how far religion influenced and enriched the lives of ordinary people.